As a leading manufacturer of custom axial AC and brushless DC fans and motors, Pelonis Technologies has been challenged in the past to design, develop, and fabricate solutions for a variety of industries. One of our recent projects was to manufacture a high-efficiency DC fan to be used in an application for the medical equipment industry. This company came to us with the need for a fan that could provide adequate cooling of their application's system components and that had variable air flow speed. 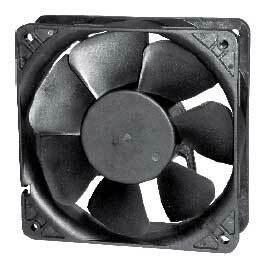 The speed of the fan would be adjusted via a frequency signal from the equipment to the fan. The customer's specifications required the inclusion of custom wire connectors and labeling. Pelonis Technologies' engineers went to work on designing a high speed 48 volt DC fan with a variable speed resistor control that was built into the electronics board of the medical application. The fan had four wires, two of which were used for power and the other two were used to connect to the equipment's system monitor for speed control. This customized fan for our medical industry client successfully passed their stringent testing for both performance and reliability. Product Description Our fan was used in medical equipment for heart monitoring. Primary: Provided custom design based on customer's requirement. Additional Facts The fan includes a manual variable resistor for speed control. As specified by the customer, we provided custom wire connectors and a label with the customer's part number. Why did you pick this piece? Pelonis Technologies specializes in providing fans that are customized to meet the requirements of the customer's application. Why did the customer choose you to do this job? We provided the required customization of speed control, wire connectors and labeling. Also, our fan successfully passed stringent customer testing for performance and reliability. What positive feedback did we receive? The customer advised us that PTI fans were working well in their equipment and we have received follow up orders for each of the last 3 years.